Each and every year a new cadre of would-be prognosticators appears, proclaiming the demise of email marketing. Yet somehow, each and every year, these proclamations turn out to be dead wrong. Email marketing is alive and well – and it’s likely to stick around for the foreseeable future. The reasons for this are relatively straightforward. First, it is nearly impossible to sign up for anything or to conduct any type of commerce online without an email address. In addition, people rely on email in their professional and personal lives. This makes its use nearly ubiquitous in modern society – cutting across demographic lines, including culture, age, and socioeconomic status. Email marketing is here to stay. It is almost impossible to sign up for online services or make purchases online without an email address. The proliferation of handheld smart devices further increases the consumption of email as well; it’s hard to not use a communication tool that is always in your pocket and fits in the palm of your hand. Mobile consumption of email has also been proven to drive secondary interactions with content; some 23% of users who open an email on a mobile device open it again later. As organizations continue to develop their applications and analysis of big data, they have found that the information gathered from email marketing channels significantly complements the performance of other pieces of their inbound marketing strategy, including content, social media, and PPC campaigns. As raw lead generators, few other tools in the marketers’ toolkit have the power of email marketing. Finally, you can always follow the money. One study shows that every $1 spent on email marketing generates $44 in return. Organizations that don’t implement an email marketing program are clearly missing out. To create a successful email marketing program, you must first understand its overall role in your marketing strategy. In the four major steps of inbound marketing methodology, email-based programs are deployed in the “Close” and “Delight” stages, after you have initially attracted interest in your product or service and converted your visitors into leads with an offer. During the “Close” stage, you turn your leads into customers by nurturing them, building trust, and continuing to provide them with valuable information and content. Once they have purchased, you progress to the “Delight” stage, and keep the communication channels open by providing them with more useful information, such as new practices or uses of your product or service, special offers, and customer support. 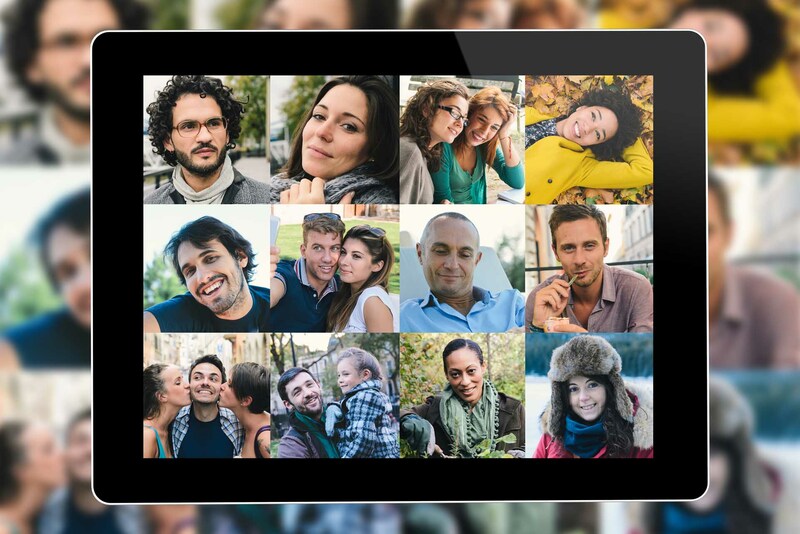 Personalized – Every communication you send must be relevant and worth their time. Never purchase lists; unsolicited emails typically have dramatically lower open, click-through, and subscription rates, and significantly higher complaints and spam reports. Also, be willing to let your subscribers go; if they want to opt-out, make it easy for them to do. Persuasive – Make sure every email you send makes a persuasive case for a specific action. Brush up on the fundamentals of copywriting and present information in a clear and compelling manner. Your emails should appeal to your target personas at a specific point in the customer journey. Pervasive – The number of emails accessed on mobile continues to grow. Ensure that your messaging displays properly across all the devices commonly used by your target audience. At the bare minimum, that means using mobile-friendly formats. Proven – One of the biggest advantages of email marketing is that almost every aspect of the campaign can accurately be analyzed in terms of real, actual, performance-based data. Take advantage of this – test early and often to boost performance over time. 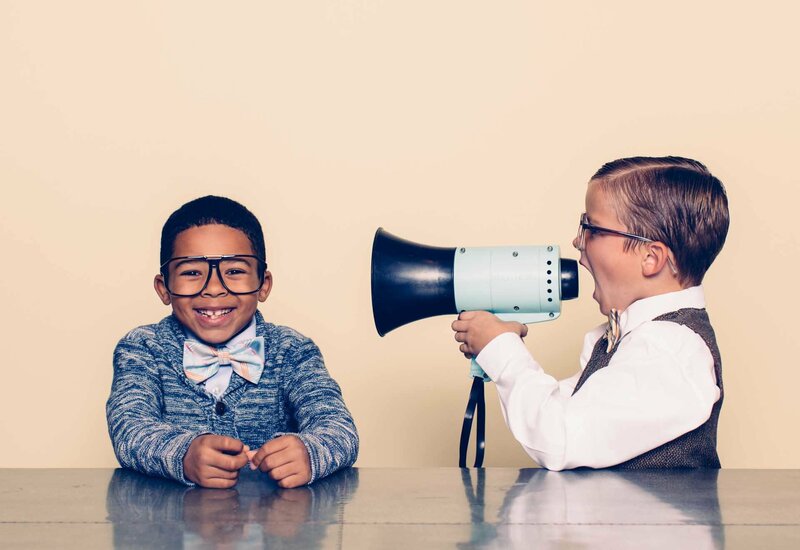 Now let’s take a more detailed look at the first two characteristics, Personalized and Persuasive, and how you can incorporate them in your email marketing campaigns. Buyer Personas – Use credible data to learn about the different personas that your business attracts. Interview them, talk with your sales reps to learn what is important to them, monitor social media activity within your industry to identify trends, and develop profiles based on the above activities. Customer Journeys – Identify the different questions and concerns prospects will have during their customer journey and understand the major milestones in the sales funnel. Personalization is one of the best tools for creating effective emails. Always consider your buyer personas and where they are in the customer journey. Foundational – Typically seen in initial messages or umbrella communications, foundational emails create a common basis and foundation for further engagement with readers. This type of messaging provides continuity in your campaign, is sent at regular intervals, and should normally be kept content-centric in nature. An example of this type of email is a monthly newsletter. Promotional – Promotional emails are direct incitements to purchase. They create product awareness and expand your share-of-wallet. Conversion paths for these emails are usually quick and direct, featuring urgency, brevity, clarity, and a strong CTA directly focused on the specific offer at hand. This type of email includes special offers and promotions from vendors. Informational – Lead nurturing is best accomplished with informational messaging. 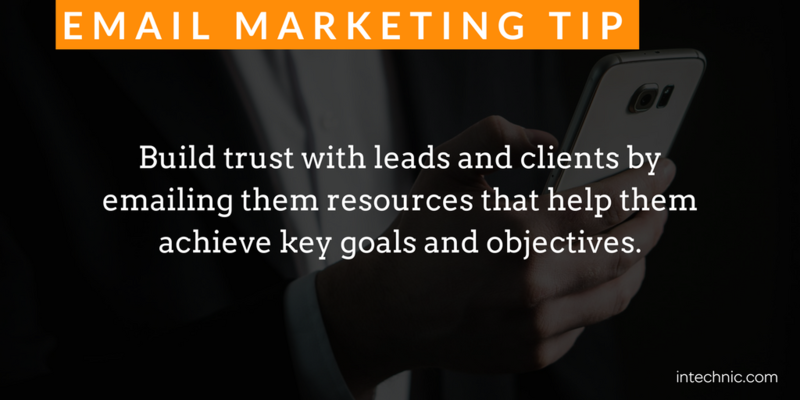 Educating leads and clients helps build trust and establish brand expertise, allows you to share critical alerts or reminders, and helps you drive traffic to your other content. 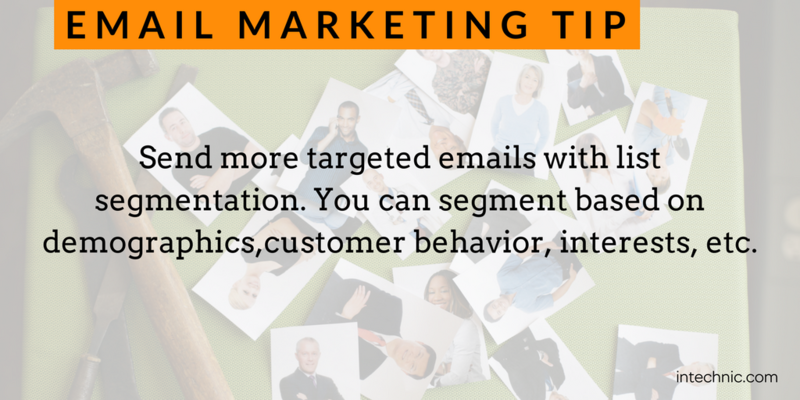 Informational emails include helpful, thought leadership bulletins to establish authority and credibility. Engaging – This type of email is designed to generate interactivity from readers. It can reward or entertain them, and provides you with an opportunity to get feedback from them at the same time. Examples of this type of email include invitations to participate in contests and surveys. 1:1 – One-to-one messaging offers the ultimate in personalization. These messages are often used in highly segmented contexts, often triggered as a result of a specific action or query on the part of a recipient. These emails are typically sent when visitors abandon items in an e-commerce shopping cart or hit a milestone on order volume. Often, this type of email has the highest response rates of any type (though they are usually the lowest in terms of volume). 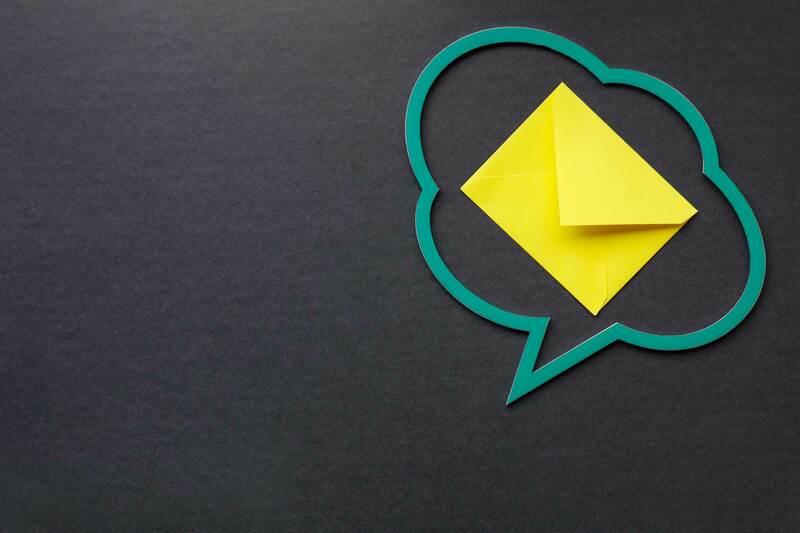 Once you have created your different buyer personas, mapped out their various customer journeys, and have an idea of the type of messaging you want to provide, you can begin to refine and personalize your message. 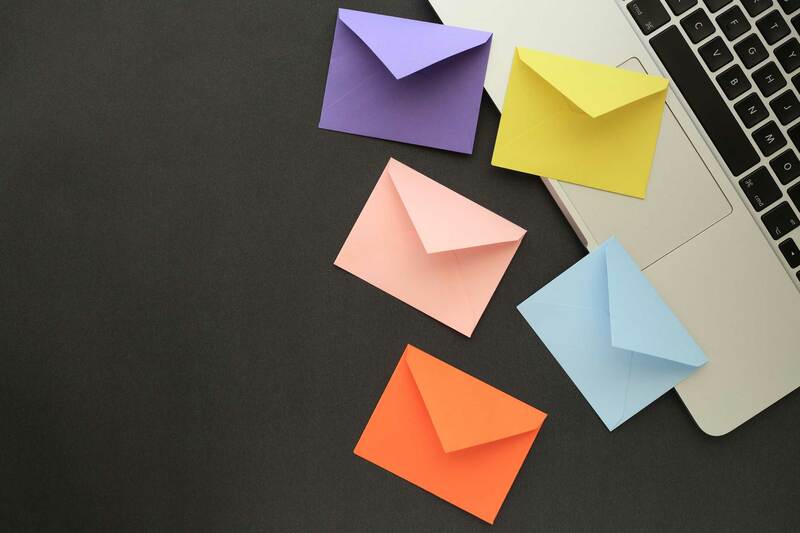 One of the most critical steps in developing an email marketing campaign is list segmentation – this practice ensures that you are sending your emails to the right people. This technique involves splitting your subscriber list into a number of smaller groups, based on whatever conditions you choose to set. 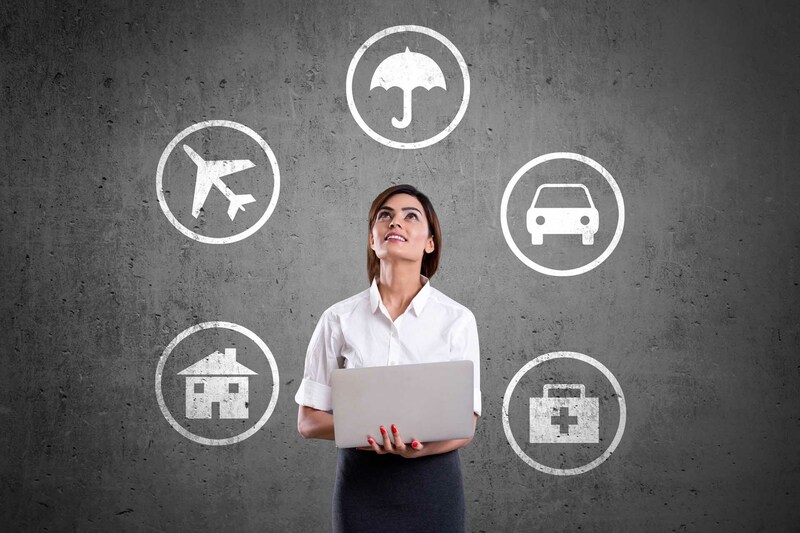 Segmentation can be based on demographics, prior customer behavior, or other factors. One effective way to personalize your emails is to use engagement data to determine when someone qualifies to receive an email. Start with readily available information, such as job title or industry, and focus on the largest sub-segments of your audience first. Then proceed to leverage source, click, browsing, and purchase data to determine what further content individuals should receive. The best-performing email marketing messages are usually contextual in nature – they are generated in response to a specific action the recipient has already made. These emails include welcome emails following customers’ registration on your site, messages thanking them for their orders and providing them with shipping information, reminders to complete the purchase they left in their shopping carts, etc. The second key characteristic of successful email marketing campaigns is that they are persuasive – you want to gently guide readers towards taking a specific action without coming off as pushy. Writing effective content is key to getting your message across. This can be done by keeping the following tips in mind. Write persuasive emails by providing value. 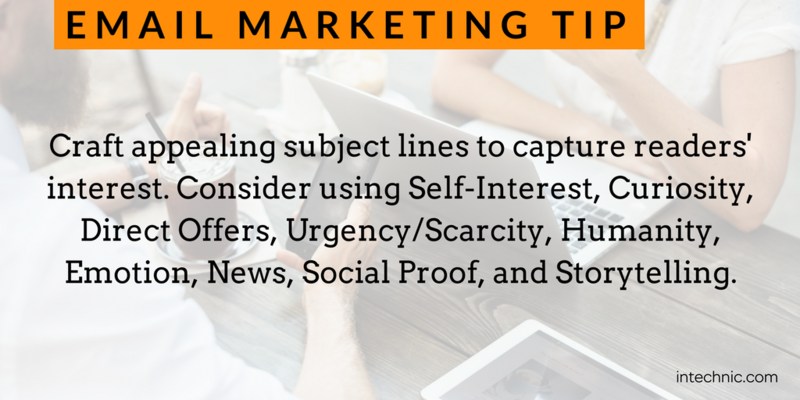 Use the right tone to connect to readers' wants and needs and grab attention with your subject lines and copy. Finally, close with a CTA to prompt action. Lead with the main value proposition of your product or service. Be authentic and honest about its benefits, and avoid using marketing-speak or internal jargon. 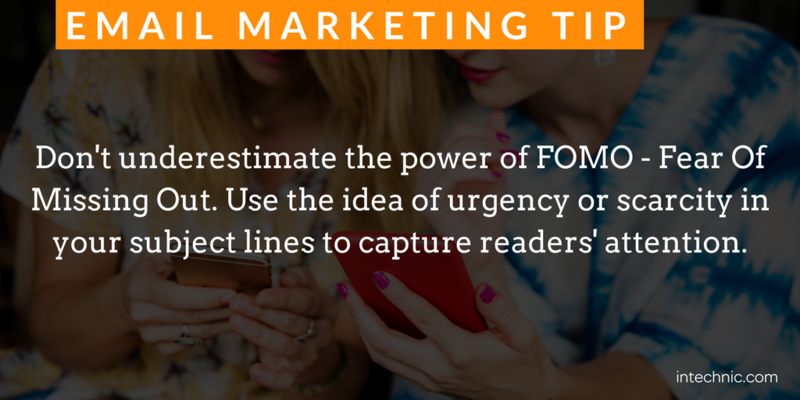 Use familiar, conversational language and emphasize the reader more than your organization. “You” should heavily outweigh any “We” in your messaging. The most effective tone you can employ within an email message helps establish an emotional connection with your audience. Use short, easy-to-read sentences, bulleted lists, and a conversational, engaging tone to make your audience more inclined to read your message and click your CTA. People rarely open email marketing messages that lack a compelling and enticing subject line. Try to create subject lines that combine appealing elements to your buyer personas and speak directly to their emotional state. This should sound as close to face-to-face communication as possible. Self-Interest – Directly show what you can do for them. Direct discounts and special offers not available to the general public are good examples of this technique. Curiosity – Non-conventional references, puns & wordplay, and evoking an aura of mystery are just a few ways to pique the curiosity of readers enough to open your message. Direct Offers – No need to beat around the bush, just cut to the chase with your offer. “40-inch Flat screen television delivered to your home for $X”, or “Contact us to discuss building a website for your business” leave little room for confusion or misinterpretation. Urgency/Scarcity – Create the impulse to act now by projecting an air of urgency or scarcity. Subject lines with the words “Tonight only,” “For the first 1,000 customers,” and “While supplies last” are all common uses of this technique. Humanity – Appeal to the better nature of your readers by showing them that you care. When making purchasing decisions, many people are influenced by what a company stands for and what it accomplishes. Using emotional appeals, such as “Help us feed hungry children,” can stimulate readers' interest. Emotion - Connect to readers by empathizing with their emotional state. Emotion is one of the most powerful triggers in copywriting, and using it effectively can generate significant interest in your message. An example of this technique is, "Avoid frustrating, unproductive meetings with our new app!" News – Demonstrate your brand expertise and grow your audience by providing them access to cutting-edge information related to your product, service, or industry. The more value you can add to your interactions with customers, the more inclined they will be to pay attention to your messaging. Social Proof – Inspire confidence in potential customers by demonstrating the results you have achieved in the past. Case studies and testimonials are particularly potent in this regard. Storytelling – Telling stories that resonate with readers is one of the fastest and most effective ways to form personal bonds. “My nine week journey to success with X”, and “How I solved my problem with Y”, are examples of this technique. Somewhat counterintuitively, you may want to begin the process of crafting your email marketing messages by starting with the final element, the call-to-action (CTA), and working backward to draft your email copy. Every word of the copy within your campaigns should reinforce and support this ultimate goal, from the subject line on through. Use language that offers a low commitment threshold to avoid driving away potential leads, action-oriented verbs, and a sense of urgency. Your CTA button should also be prominently placed. Use color, contrast, and location to help it stand out from the rest of the content in your email. And that's it for the first two Ps for creating successful email marketing campaigns - Personalized and Persuasive. In the next article of this series, we will examine the final two Ps of email marketing, Pervasive and Proven.